When a scope mounting system costs as much as a factory hunting rifle, it better be something special. 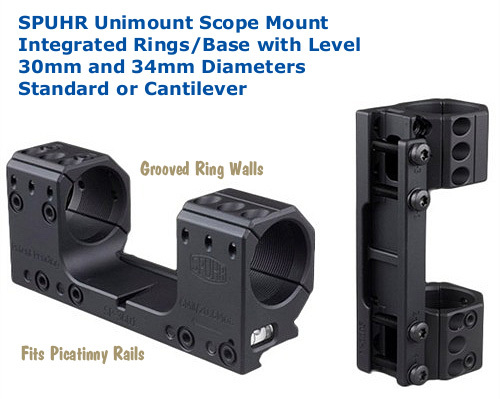 At $410.00, the Spuhr Unimount Scope Mounting System is one expensive piece of kit. But if you shoot .338 Lapua Magnums or 50 BMGs, this mount may be worth the money. Made in Sweden, the aluminum Spuhr Unimount integrates “rings” into a +20.6 MOA (6 MIL) base with built-in bubble level. The matte-black-anodized Spuhr Unimount has some interesting design features. The clasping bolts are set at a 45° angle. Ring internal surfaces are grooved for enhanced “grip” (these are not threads — the surface is precision ground and smoothed so there are no sharp edges). Available in 30mm and 34mm diameter (and various heights), the Spuhr Unimount even comes with a scope indexing tool to help you align your scope correctly with the mount. Along with the standard Unimount shown in the photo, a cantilever-sytle Unimount is offered for AR-platform rifles and other guns requiring forward scope placement. Share the post "From Sweden — SPUHR Unimount Scope Mount System"
Here’s a news item of importance to all our readers who have an FFL or who may process firearms transfers. 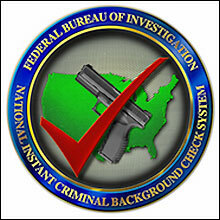 The FBI’s National Instant Criminal Background Check System (NICS) has announced that the current E-Check system will be upgraded to version 2.0, effective July 16, 2013. Among a host of new features will be the elimination of the digital certificate and the ability to access NICS E-Check using any computer and browser. Target date for deployment is July 16. FFLs currently using the E-Check system should plan to re-register on (or after) July 16, 2013. You can register at the NICS E-Check Web site: www.nicsezcheckfbi.gov.  You will be able to access NICS E-Check using any computer or browser.  Added customer protection against identity theft.  Added safeguard against theft of license number and codeword.  Ability to retrieve NICS background check results 24/7.  Ability to retrieve background checks initiated on E-Check or at the Call Center.  Ability to print completed NICS background check search requests.  The availability of messages regarding NICS operational status.  No hold times waiting for the Call Center.  No hold times waiting for a NICS Representative to review a transaction. The National Instant Criminal Background Check System (NICS) was established to aid FFLs in determining whether or not the transfer of a firearm would violate state or federal law. Mandated by the Brady Handgun Violence Prevention Act of 1993 and launched by the FBI on November 30, 1998, NICS is used by Federal Firearms Licensees (FFLs) to instantly determine whether a prospective buyer is eligible to buy firearms or explosives. Before ringing up the sale, cashiers call in a check to the FBI or to other designated agencies to ensure that each customer does not have a criminal record or isn’t otherwise ineligible to make a purchase. More than 100 million such checks have been made in the last decade, leading to more than 700,000 denials. Share the post "National Background Check System Upgrade on July 16, 2013"